George Osborne didn’t sell Northern Rock at 80% of book value, but at 66% of book value, reports Cormac Hollingsworth. Last week the Guardian and Mail both reported George Osborne had lost £400 million by selling Northern Rock too cheap to Virgin, a figure that compares the £1,121 million of equity ( assets such as loans) on Northern Rock’s balance sheet with the £747 million Virgin has paid in cash. This represents a price to book value ratio of 66%. However, the chancellor has made a point of how good a deal he’s done on Northern Rock by spinning it as representing an 80% ratio of price to book value. How has he done this? Osborne’s valuation includes the £150 million in capital notes the government has loaned the Virgin Consortium – Capital notes are essentially a form of loan that puts the lender in a riskier position, than if they were, let’s say, to lend the money directly to Virgin Consortium. The government has had to engage in this ‘vendor financing’ – a trick pulled by the Glazers when they bought Manchester United – because Virgin clearly can’t find a private investor to back the deal. It appears the Daily Mail are right, as the capital notes are likely to be worthless over the course of this parliament. Hoban: “What we put in place with Virgin Money is a capital instrument which is an important part of its financing structure, and the terms of that instrument will be set in place shortly. “It is important to recognise that we want to see a well capitalised bank there. “The FSA will look very carefully at the structure of Northern Rock and its ownership. As I said, Virgin operated a business model whereby it has capital levels which are much greater than those of some of its peers. The government can’t guarantee it will get its money back because of the FSA rules on these capital notes. Mark Hoban could still have said he was confident they would get the money back and that coupons (the interest) would be paid. Unfortunately, however, given the combination of the rules for the capital notes, together with the fact Northern Rock as a new corporate entity has only lost money since incorporation in January 2010 means that the government is both unlikely to receive neither the principal nor any 10.5% coupons. In fact on close examination, the government has given Virgin 0% vendor financing on this £150 million. If this were ever challenged in a court, the court would refer to the terms of the capital notes. The terms of these Notes have been designed to be compliant with current GENPRU requirements and the expected requirements of forthcoming CRD4 regulations which will implement Basel III guidelines into European law. Accordingly they include features such as principal loss absorption and discretionary interest coupons. The key point here is discretionary interest coupons. Others may be worried about “principal loss absorption” in the terms – you should be, but we don’t have space to go into all the horrible parts of this deal. GENPRU 2.2.69A: A BIPRU firm must not make a payment of a coupon on an item of hybrid capital if the firm has no distributable reserves. The key phrase here is “distributable reserves”, and the problem is that according to Northern Rock’s latest results it has no distributable reserves. (See pdf). The two sections of its balance sheet that are distributable are other reserves and retained earnings – both negative. (2). Such a substituted payment preserves the firm’s financial resources. 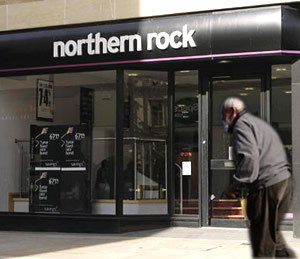 The reserves will become positive as Northern Rock starts making profits. The problem is that the company expects to still make a loss next year, so making it more negative. Even if the company makes as much money as Coventry Building Society (a similar sized balance sheet) of around £80 million per year, it will be after the end of this parliament before it will have the financial capacity to start making distributions. And what about redemption of the £150m principle? (a). Before the fifth anniversary of its date of issue. There are two problems for the taxpayer. First the capital notes are only redeemable at the option of the firm. That is, if a future government tries to take Virgin to court to recover the £150 million, the case will be thrown out – the terms say it’s Virgin’s decision when they give the money back. Secondly, the FSA insists that at a minimum the money can’t be paid back for at least 5 years – so January 2017. At some stage the coupons will be paid but not for a few years, however it is quite reasonable to assume the £150 million itself could never be paid back. So while Mark Hoban’s brief said the government doesn’t want to be a long term investor in the banking sector, with this Northern Rock transaction it could be an investor forever. This is an incredible deal for Virgin, zero per cent financing on £150 million for the life of this parliament. The incredible thing is why this government was happy to buy it. But if it is worthless, then this completely changes the valuation Osborne quotes, and in fact the real valuation is just the cash Virgin put up. So Osborne didn’t sell Northern Rock at 80% of book value, but at 66% of book value, the Daily Mail’s number. Interesting analysis. Is the main objection here that the bank was sold too cheap or that it shouldn’t have been sold into the private sector at all? Because given that most big European banks are trading at a discount to book value right now (c 0.7-0.8x on my latest screen), the Virgin price is not far off market and presumably they took the highest price on offer. Do you think other forms of sale would have got the taxpayer more money back or got it back quicker or is the opposition just to the presentation by the Government? Apologies, posted by accident. Two observations. First, I don’t recall the acquisition of Manchester United involving any vendor financing. It was a highly leveraged purchase to be sure, but no financing from existing shareholders. Second, implicit in this article is that the treasury has done a bad deal by selling at a loss. But that ignores the other main driver of return – the price that was paid originally. It could just as equally be argued that the original acquisition by the government was done at too high a price (bondholders weren’t obliged to take a haircut) and that the treasury have actually achieved a very good price. The commenter below notes that large banks are trading at 0.7-0.8x book. That is true but Lloyds and RBS are currently much lower. Perhaps not such a bad deal by those evil tories after all. http://t.co/fVLXJa7A Osbourne sure knows how to make something look better than it is. @PJ more analysis to follow over this week.